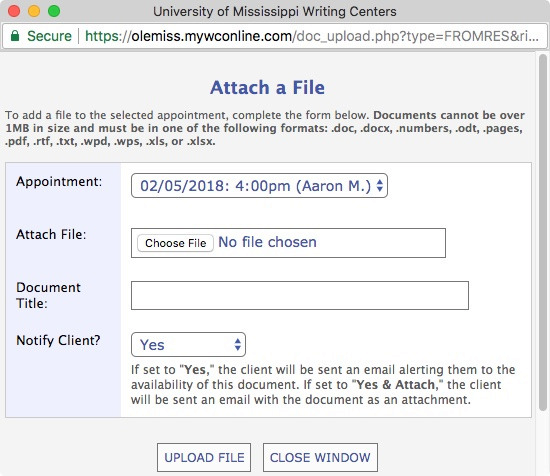 The University of Mississippi Writing Centers offer two types of online consultation appointments to meet the needs of busy students. Getting started with an assignment can sometimes be the hardest part! If you are looking for an opportunity to ask quick questions, brainstorm, or just discuss your ideas with a writing mentor, our convenient online chat appointments work well for this stage of the writing process. Chat from home or work and choose an appointment time that works for you! Once you have registered and signed in to the scheduler, click on any of the white blocks on the calendar to request a live-chat appointment (gray and blue boxes are unavailable times). Select “Online Chat” from the drop-down menu next to “Meet Online?” in the appointment reservation form. 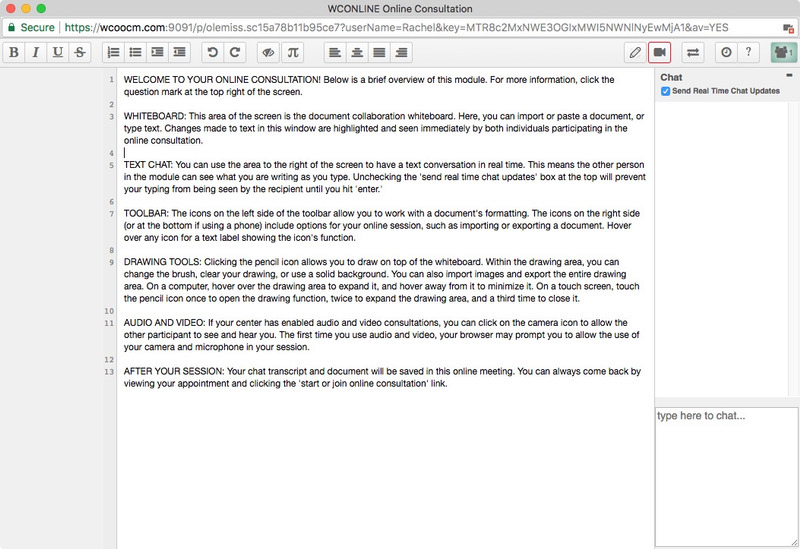 You can paste some or all of your draft in the online consultation window and chat with the consultant using text, audio, or video. When you are almost finished with a piece of writing, it’s always a good idea to share your writing with someone who can help you look for ways to improve and polish a draft. We have special online appointments where you can upload a draft to an appointment reservation and receive feedback and guidance from a consultant before the end of the day. This is especially convenient if you are unable to make it to campus. Once you have registered and signed in to the scheduler, click on any of the white blocks on the calendar to request a correspondence (gray and blue boxes are unavailable times). Select “Correspondence” from the drop-down menu next to “Meet Online?” in the appointment reservation form. Be sure to provide areas of concern as well as your overall goal for the consultation in the provided text box. Attach your file to the appointment once you’ve saved your reservation. You can attach multiple files to your appointment.